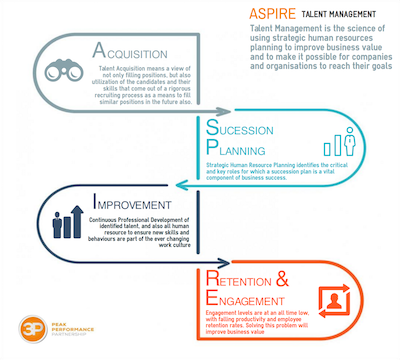 ASPIRE by 3P is our lifecycle talent management solution which supports the talent lifecycle of Acquisition, Succession Planning, Improvement and Retention and Engagement. To be simple, talent acquisition is the ongoing process of attracting, recruiting, inducting and making use of the right talent in alignment with your business objectives and goals. The acquisition of talent can be an expensive, time-consuming and subjective task. Using simple-yet-sophisticated talent analytics brings the certainty that you have the right people in the right jobs, so you spend less resources on hiring and firing, and more on growing your business. Succession Planning helps you to identify and prepare future potential talent to fill critical and key roles to safeguard business continuity. Business growth can be hindered by not having the right people in the right jobs to help drive that growth strategy. 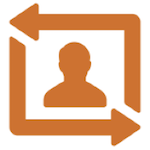 We help you to anticipate, rather than react, to changes in your business such as leavers, demand, capacity, or environment. We work with you to create a thoughtful plan to mitigate people risk and ensure your business is talent-fit at all times. Improvement and development of your people is the cornerstone process of bridging the skills and behavioural gaps needed to drive people, talent and business growth in your organisation. A lack of investment in the Continuous Professional Development of people and talent creates a skills and behavioural gap which can impact productivity and business performance. Your people will have access to the 3P Academy, where they will be trained and developed according to individual needs that are aligned to your business objectives and goals. Engagement is the emotional, intellectual and social commitment to your company’s culture, values and beliefs… Talent retention is your reward. Employee engagement levels are at 30%, which potentially means only 3 in 10 employees have that commitment to your business. Using in-depth analytics 3P will help you to match business and personal expectations that drives improvements in retention and engagement and business performance.